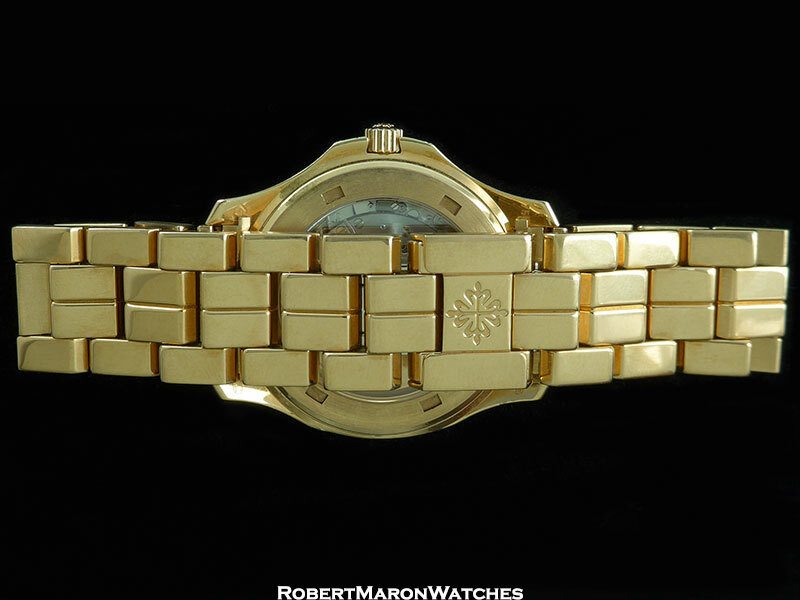 The full size Aquanaut reference 5065J on the 18k bracelet is a rare watch. 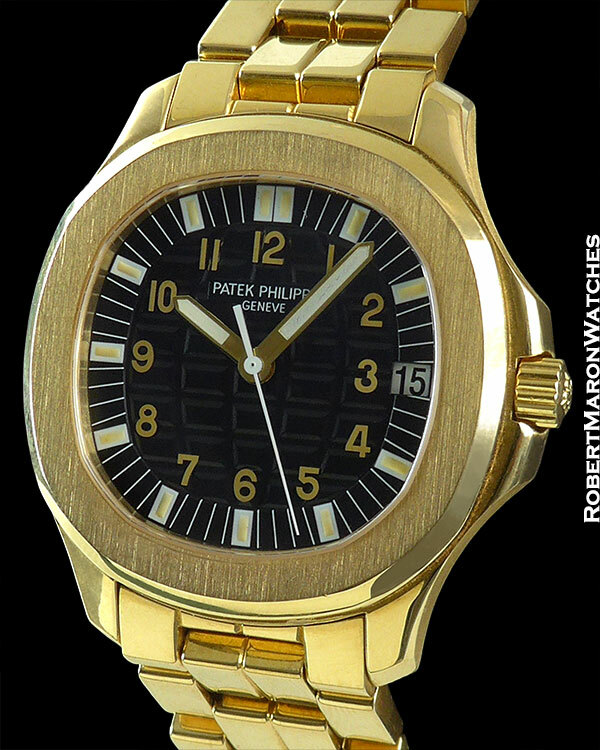 To find it in mint condition with box and extract from Patek is even more remarkable. The Aquanaut is one of Patek’s most recognizable and iconic designs, which reveals the wearer to be discerning, tasteful, and successful. And let’s not forget that the watch is beautiful. 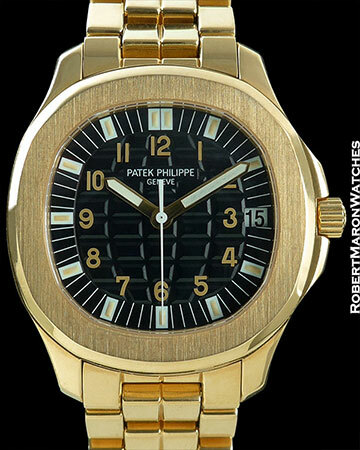 The 18k solid gold case is cushion shaped and features, naturally, the Aquanaut’s classic and uniquely shaped bezel. The top of the bezel is brush finished, while most of the rest of the case, including the full size bracelet, is mirror polished. The whole idea of the Aquanaut, which the name reflects, is that it is a watch that can be worn in the water, and is probably the best known luxury sports watch ever. The case is water resistant to 120 meters. The crystal is sapphire, and there is also a display back which has a sapphire crystal. Case dimensions are 40.5mm wide by an astonishingly thin 8’’ thickness. The dial is black with an oversized “Clous de Paris” pattern engraved, and with luminous hour markers and hands. The Arabic numerals are golden and applied. Date window is at 3 o’clock. 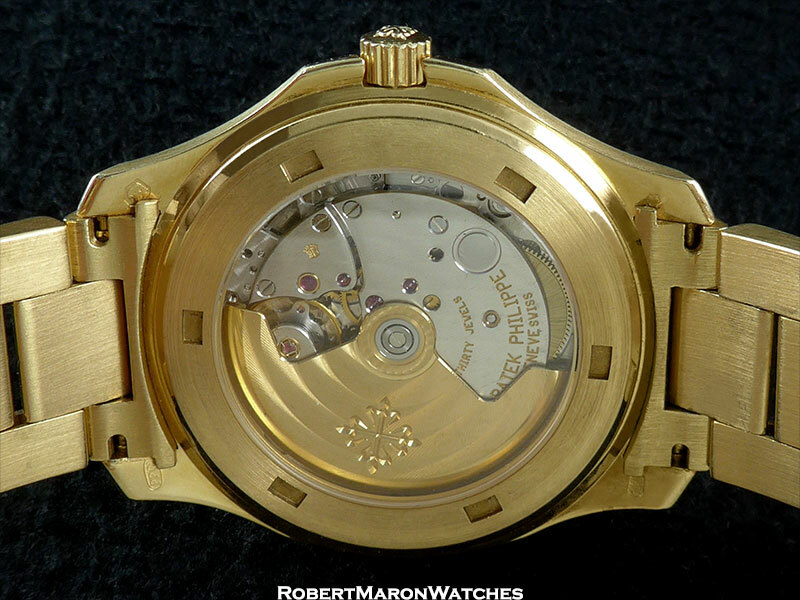 The movement is the automatic winding Patek Philippe Caliber 330 SC with 30 jewels, 6 bridges, Gryomax balance, beating at 21,600 beats per hour, with 228 individual parts, with a 48 hour power reserve and stamped with the Geneva Seal.